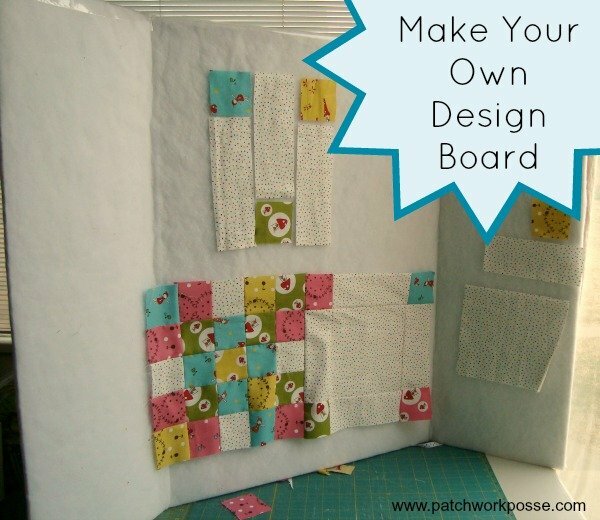 The other day I was shown how to make your own design board. It is so super simple and such a great idea, I had to share. You might even have a few of the supplies already in your home…or can quickly grab them if you don’t. I don’t have any wall space in the sewing cottage. It’s all taken up by supplies, fabric, tables and the big quilting machine. There really is no space at all to layout a few blocks to get a better view of them. Along with that problem, I am president of a local quilt group and do a lot of demonstrations. This is so handy to toss in the car and haul around. It’s a bit bulky, but once you have it there, it’s so nice to use! 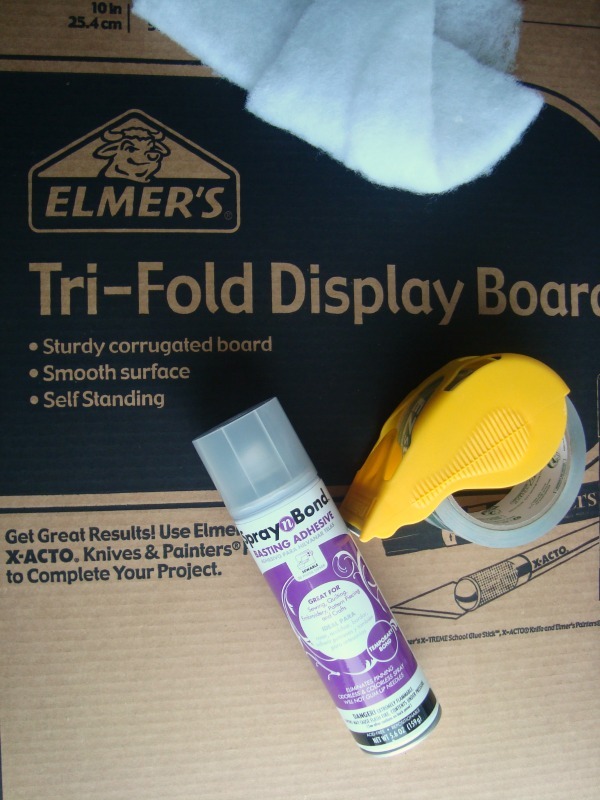 tri-fold display board. I found mine at Walmart for under $3. They do come in a few different sizes. You can check them out and pick the one you think you’d like the best. They are in the school supply aisle and are for the science fair displays. spray glue- I used thermoweb spray-n-bond basting adhesive. I tried another spray glue and it wasn’t tacky enough for me. 1) Lay the board- open on top of the batting. You will need a big table or floor area for this. The board will be face down with the blank area on top of the batting. 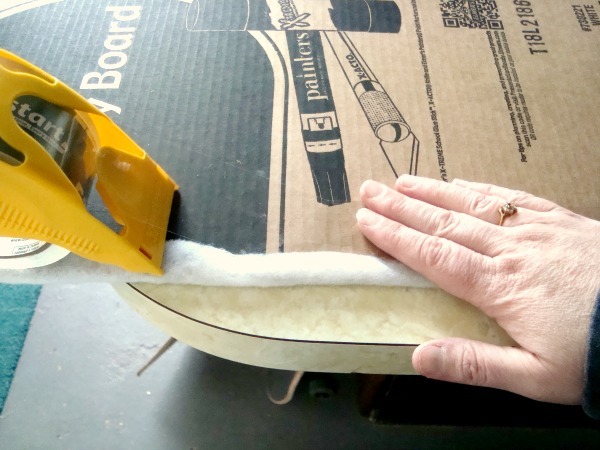 2) Cut the batting at least 3-4″ larger than the board on ALL 4 sides. 3) Lift the board and spray the batting– this isn’t do or die here. You can skip this step. I found it nice though because it keeps the batting from shifting and bubbleing. 4) Place the board on top of the batting again and press to secure. 6) Use it! 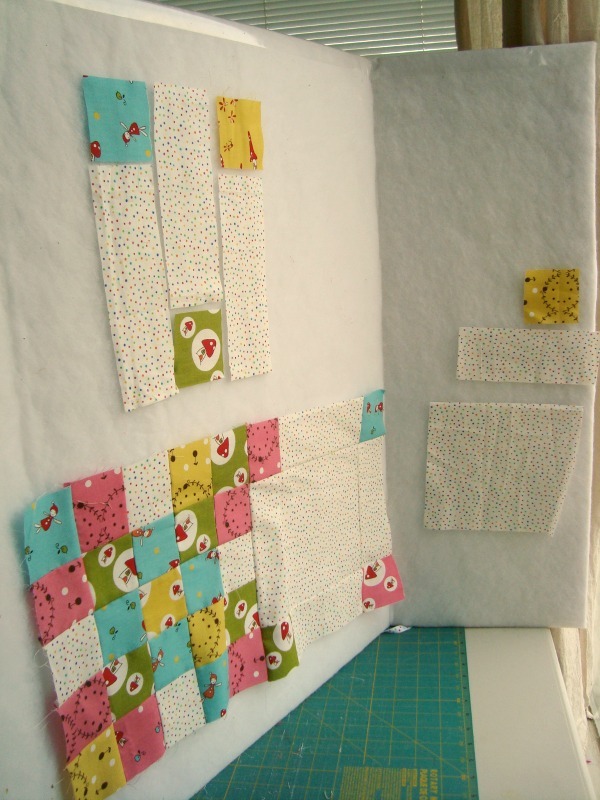 You can lay out small quilts, quilt blocks, rows, or quilt block pieces before they are sewn to keep them in order. This is so handy to have around. You can also use pins on it. They can go through the batting and won’t cause any problems if they poke into the board. To store it, simply fold in the sides and there ya go! The sides cover the batting and keep the pieces in place if you are still working on them, and clean. It can easily stand on a table or floor, or move to where you need it. Great for demonstrations to groups too.